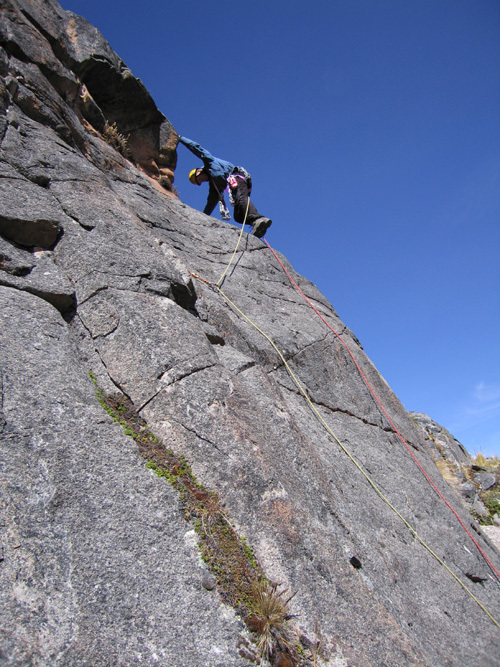 This page mostly deals with the areas around Huaraz in the foothills of the Cordillera Blanca and Negra as these are the areas I have done most climbing personally. 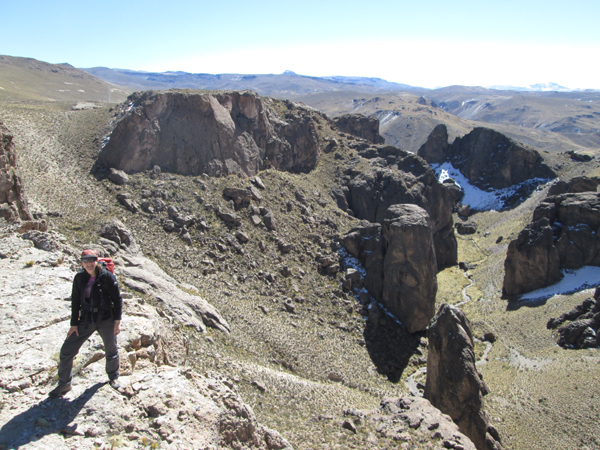 There is also a couple of photos of some mountain rock routes in the Cordillera Carabaya near Macusani and the smaller sport climbing crags near the Colca Canyon. 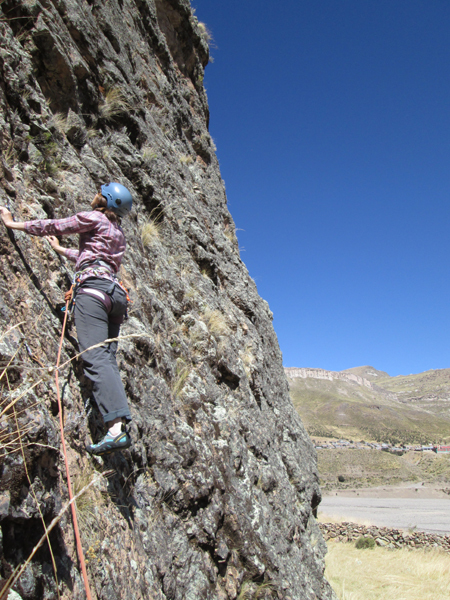 The best area to climb in Peru is certainly still in and around Huaraz in the north, however rock-climbing is becoming quite a developed as a sport in many areas of Peru now and there are new climbing areas outside several of the larger cities in the mountains. 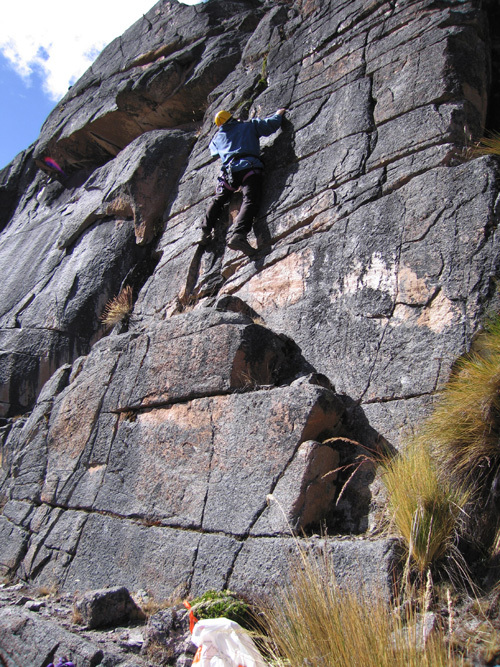 There are several developed rock-climbing areas just outside the city of Huaraz in the scenic Callejon de Huaylas valley. 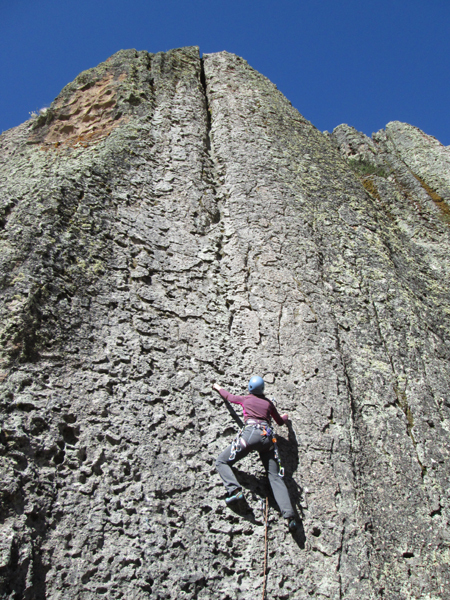 There are small crags at Los Olivos and Chancos equipped with bolts and/or pegs. 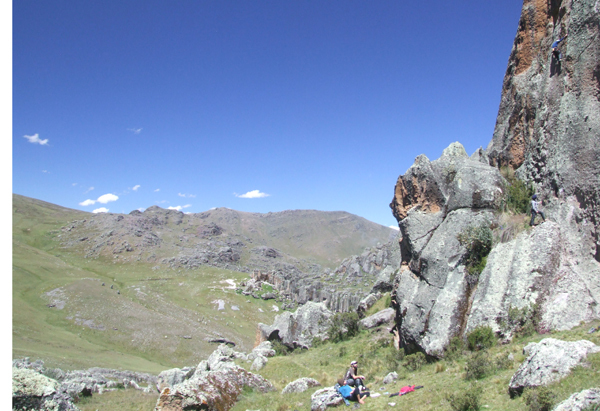 Rock climbing on the crags at Los Olivos near Huaraz, Peru. 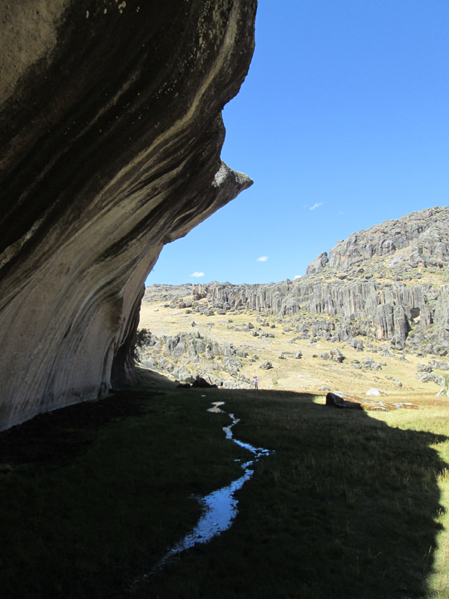 There is also some limited but good quality bouldering at Huanchac near Huaraz. 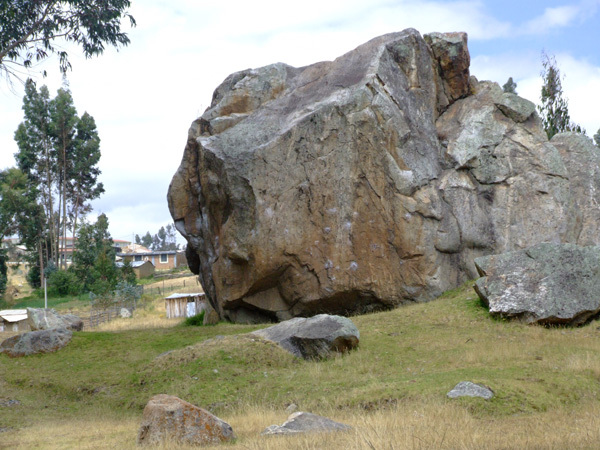 The boulders are in a kind of communal field just by the small stream in the middle of the village. You can walk here in about ½ hour (all downhill) from the ruins at Huilcahuain. 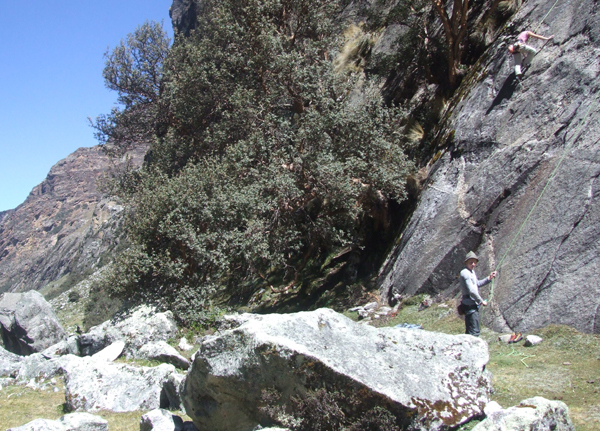 About 1½ hours drive south of Huaraz on the slopes of the Cordillera Negra is the newly developed climbing area of Hatunmachay, with dozens of sport routes and some good bouldering. There is a small refuge and a camping area here. 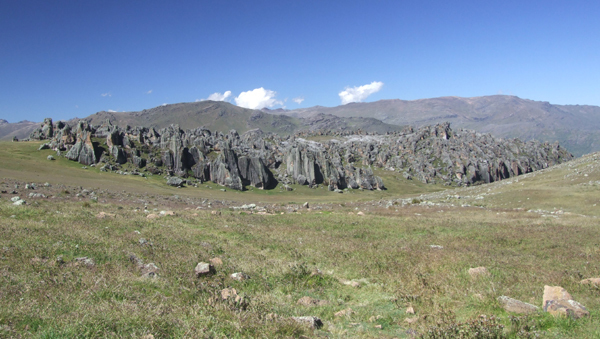 It is easy to arrange transport here from Huaraz, but there is no public transport. Just use a taxi or ask with one of the tour agencies in town. As well as top quality sport climbing there are incredible views of the southern Cordillera Blanca and the Cordillera Huayhuash from the wee hill near the refugio. Another view of the Placa Verde climbing area at Hatunmachay. The climbing area at Hatunmachay from the refugio. 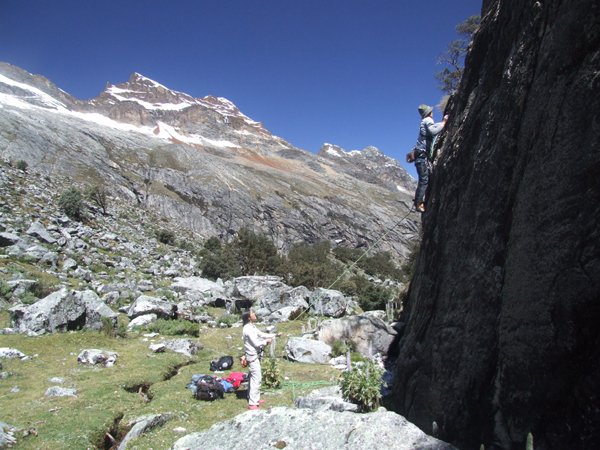 In this valley in the Cordillera Blanca there are two or three small sport climbing areas. Compared to Hatunmachay the grades are a bit stiffer and the climbing is a bit sketchy... but if anything the views are even better! Once again there is no public transport up here, but it easy and not too expensive to arrange a taxi to drop you off, then pick you up again later. Torre de Paron, also known as the Sphinx. 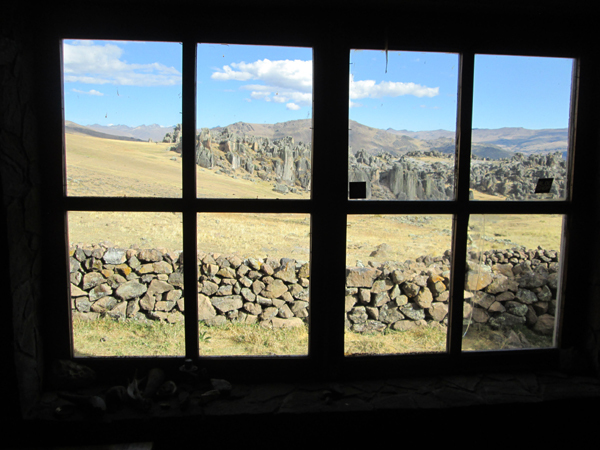 An area with great bouldering potential at 4300m, located south of the highland town of Cerro de Pasco. I have done a number of routes on good quality mountain rock in the Cordillera Carabaya, generally finishing at about 5000m. 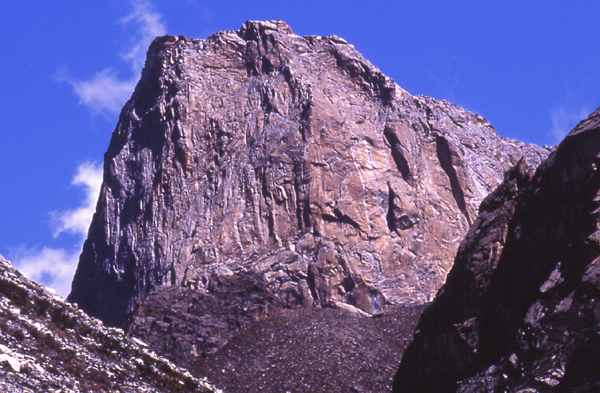 Mountain rock climbing in the Cordillera Carabaya near Macusani, Peru. 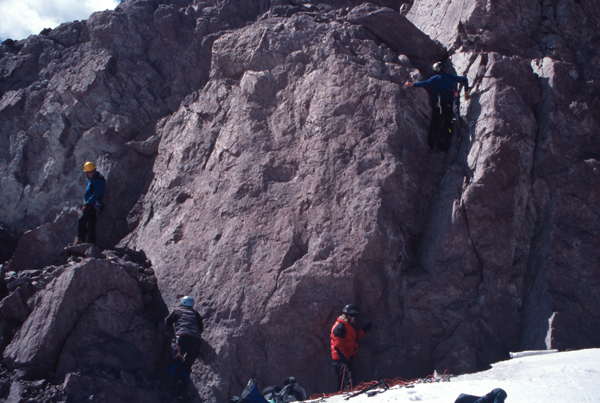 This was a mass ascent of the 5267m rock tower above Laguna Chambine, by all six of us on the expedition. Two short pitches with routes form V.Diff to HVS, all at over 5000m above sea level. 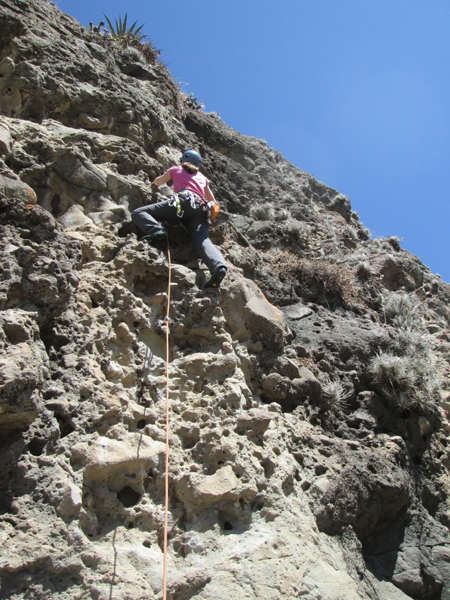 There are several areas with some developed rock climbing near Chivay in the Colca Canyon, near the southern Peruvian city of Arequipa. 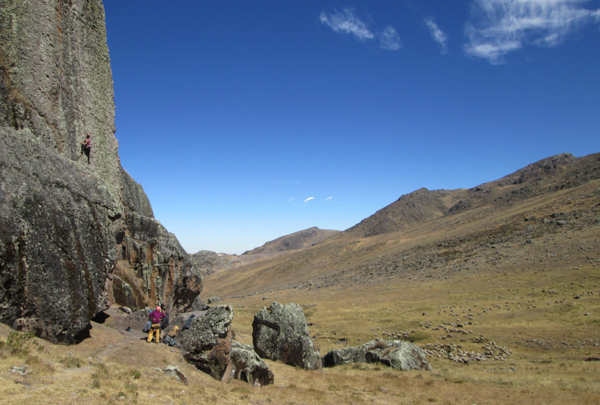 The climbing area at the Ventana del Colca is right by the road, but is at 4200m above sea level. There are a about a dozen routes here, but potential for many more. 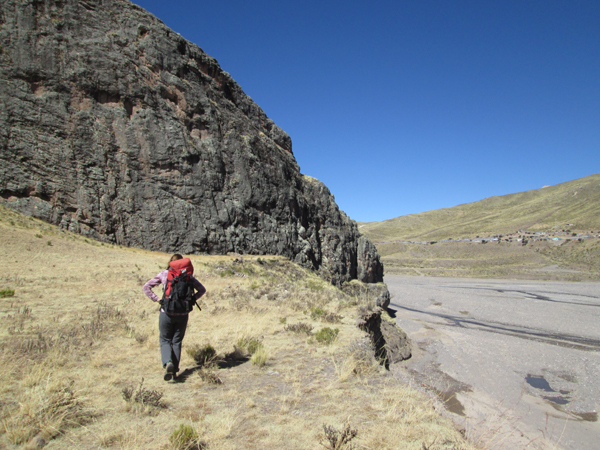 Approaching the crags at Callalli, ½ hour drive from the town of Chivay. Climbing at Callalli, at 3900m.